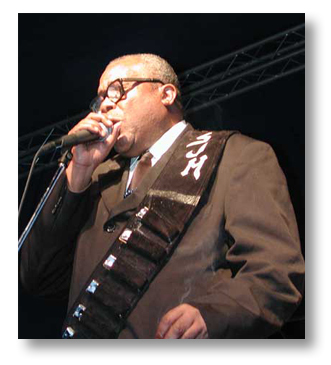 Sam Myers, best known as a blues vocalist and harmonica player, had been with The Rockets as their featured vocalist since 1986. Myers, along with The Rockets, collectively won nine W.C. Handy awards, the blues community’s equivalent to the Grammy awards. The Laurel, Miss., native had performed since his late teens dating back to the early 1950s. He moved to Dallas in the 1980s. Myers was a former drummer with blues great Elmore James from 1952 to 1963 and had performed with countless others. Myers got started in music while living in Jackson. He became skilled enough at playing the trumpet and drums that he received a non-degree scholarship from the American Conservatory School of Music in Chicago. Myers attended school by day and at night frequented the nightclubs of Chicago’s South Side, meeting and sitting in with Jimmy Rogers, Muddy Waters, Howling Wolf, and Little Walter. In 1956, Myers wrote and recorded what was to be his most famous single, “Sleeping In The Ground,” a song that has been performed by Eric Clapton, Robert Cray and others. His last appearance in Mississippi came in February when he was presented the blues ambassador award by Gov. Haley Barbour. Myers was diagnosed with cancer in February 2005, and had been unable to perform with his band since December 2004. 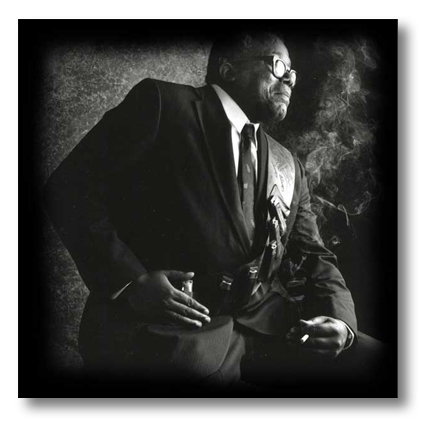 Legendary bluesman Sam Myers died in July 2006 of oral cancer at his Dallas home, according to his sister, Eula Jones. He was 70. David G. Pfister et al. To develop a clinical practice guideline for treatment of laryngeal cancer with the intent of preserving the larynx (either the organ itself or its function). This guideline is intended for use by oncologists in the care of patients outside of clinical trials. A multidisciplinary Expert Panel determined the clinical management questions to be addressed and reviewed the literature available through November 2005, with emphasis given to randomized controlled trials of site-specific disease. Survival, rate of larynx preservation, and toxicities were the principal outcomes assessed. The guideline underwent internal review and approval by the Panel, as well as external review by additional experts, members of the American Society of Clinical Oncology (ASCO) Health Services Committee, and the ASCO Board of Directors. Evidence supports the use of larynx-preservation approaches for appropriately selected patients without a compromise in survival; however, no larynx-preservation approach offers a survival advantage compared with total laryngectomy and adjuvant therapy with rehabilitation as indicated. All patients with T1 or T2 laryngeal cancer, with rare exception, should be treated initially with intent to preserve the larynx. For most patients with T3 or T4 disease without tumor invasion through cartilage into soft tissues, a larynx-preservation approach is an appropriate, standard treatment option, and concurrent chemoradiotherapy therapy is the most widely applicable approach. To ensure an optimum outcome, special expertise and a multidisciplinary team are necessary, and the team should fully discuss with the patient the advantages and disadvantages of larynx-preservation options compared with treatments that include total laryngectomy. Two experimental vaccines could someday extend life and improve the quality of it for people with head and neck cancer. Head and neck cancers include those of the throat, mouth, voice box, sinuses and skin. They can be hard to treat and have a high risk of recurrence. Healthwatch Reporter Kellye Lynn spoke to patients who suffer from the disease, and to the University of Maryland doctors testing the vaccines that could help them live longer. This year about 40,000 people in the United States will learn they have head and neck cancer. Lisa Harrigan got the diagnosis in 1999. Now, the cancer that started in her throat has spread to other parts of her body. “This is my last chance because I’ve had everything. There’s not much more you can do,” Harrigan told Healthwatch Reporter Kellye Lynn. A scan of Lisa’s brain shows a mass which doctors say cannot be treated by existing therapies. Her only hope is an experimental therapy being tested at the University of Maryland Medical Center. The vaccine, which is in its first phase of testing, is designed to stimulate the body’s immune response against cancer. It works by targeting the proteins linked to Squamos Cell Carcinoma, the most common form of oral cancer. “It’s a way to try to turn on the immune response so it recognizes the tumor but not the tissues around the tumor,” said Doctor Scot Strome, who is testing the vaccines. Patients receive four shots at monthly intervals. And Lisa says she felt better after the first injection. “I’m still here and I’m still alive and I thank God for that,” she said. People who smoke are six times more likely to develop head and neck cancer. Alcohol intake and sun exposure also increase risk. A powerful new medical isotope — Cesium 131(TM) — is providing a fast and effective treatment option for prostate cancer patients nationwide. Offering significant advantages over other medical isotopes now in use, Cesium-131 represents the first major leap in seed brachytherapy in 20 years. This major advancement in seed brachytherapy will be spotlighted at booth #141 during the 48th Annual Meeting of The American Association of Physicists in Medicine (AAPM), July 30-August 3, 2006 in Orlando, FL, at the Orange County Convention Center. AAPM (www.aapm.org) is a scientific, educational, and professional organization of more than 6,000 medical physicists. “Brachytherapy has proven to be effective, but the introduction of Cesium-131 takes this treatment option to a new level. Attendees at AAPM will be introduced to a breakthrough option for fast and effective treatment of prostate cancer,” said Chairman and CEO Roger Girard. Seed brachytherapy — where seeds are implanted in and around a cancerous tumor — is a proven and common treatment for prostate cancer, with 50,000 to 60,000 procedures conducted each year. Clinical data shows that patient outcomes for seed brachytherapy are superior to those for radical prostatectomy, external beam radiation, IMRT, cryotherapy and experimental procedures at far less cost and with a much higher quality of life. Now available in over 50 locations across the United States, Cesium-131 delivers its therapeutic radiation faster than other isotope seeds — Palladium-103 and Iodine-125 — and at a reduced risk to patients when compared to surgery and other treatment options. Cesium-131 is a proprietary product of IsoRay, Inc. (“IsoRay”), an innovative medical technology company based in Richland, WA. Cesium-131 received Food and Drug Administration 510(k) clearance in March 2003. Due to its unique characteristics, Cesium-131 patients receive a higher initial dosage of radiation that kills cancer cells more quickly. Its short half-life means that radiation leaves the body sooner than other isotope options. Cesium-131 has significant advantages over Palladium-103 and Iodine-125. A fast-acting isotope, Cesium-131 delivers 90% of its dose in just 33 days. With reduced chances of normal tissue exposure, Cesium-131 has a 9.7-day half-life (compared to 60 days for Iodine-125 and 17 days for Palladium-103) delivering less total radiation to the patient while achieving a more homogeneous implant. Cesium-131 also provides superior tumor penetration. The energy level of the isotope is 29 KeV, providing more than 30% greater penetration of the cancerous tissue than Palladium-103. The Cesium-131 seeds can also be manufactured “to order” based on patient needs. Girard, Dr. Kurtzman and other IsoRay Medical executives will be on hand at the IsoRay Medical booth during this year’s meeting, which organizers expect to be the most highly attended AAPM meeting to date. A seed brachytherapy procedure involves the use of special needles to implant the seeds, which are smaller than a grain of rice, using ultrasound guidance. The implant procedure is fast and convenient and the patient typically returns to normal daily activities within two to three days. Since it was introduced in October 2004, over 400 patients have been treated with the Cesium-131 isotope at leading cancer treatment hospitals and clinics across the United States. The centers for Medicare and Medicaid Services have established a specific reimbursement code for Cesium-131, and most insurance companies also cover the cost of the brachytherapy procedure, a common and widely accepted treatment option. Although IsoRay Medical’s Cesium-131 seeds have been used exclusively for treatment of prostate cancer to date, Cesium-131 has FDA clearance for the treatment of any malignant disease, including cancers of the head and neck, brain, breast, prostate, and other organs. Initial development of the Cesium-131 seed began more than 40 years ago, but scientific and economic considerations prevented its complete development. Lane A. Bray, chief chemist of IsoRay Medical, eventually developed the patented process for economically separating and purifying Cesium-131. There’s new information on using heat to kill cancer tumors. The procedure is called Radio Frequency Ablation. It doesn’t easily roll of the tip of your tongue, but it is a nonsurgical option for treating early cancer. Louis De Pasquale, accompanied by his wife Diane, is on his way to the radiology treatment suite at Memorial Sloan Kettering Cancer Center. The 73-year-old retired electrician has a small cancerous tumor in his lung. De Pasquale did not want to have surgery so he opted instead for the procedure which will require no cutting, R.F.A., which stands for Radio Frequency Ablation. Dr. Stephen Solomon, an interventional radiologist, uses high tech imaging machines, a cat scan, and an advanced x-ray machine to put the needles. With these machines, he can see the tumor and the needles directly and in 3-dimensions. Once he is comfortable with the placing, the energy is turned on for 10 to 30 minutes. The tumor is killed. The dead tissue stays in the body and over time is absorbed. The procedure has both advantages and disadvantages over a surgery and few small studies have shown it can extend life, the final word is not on that is not in yet. 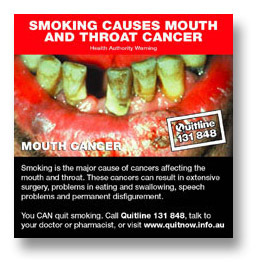 The Federal Government has fired up its anti-smoking campaign with new national regulations forcing tobacco companies to include large colour photos of diseased and cancerous body parts on cigarette packs. Previous anti-smoking warnings have proven to be impotent against the ‘evil’ and vicious cycle of nicotine addiction and it seems smokers’ attempts to kick the habit would continue to be futile without these other more strident warnings and bans planned to come into force state by state. So instead of the tamer text warnings that have become so ubiquitous, smokers are seeing a range of photographs of lung disease cases, tongue cancers and even a dissected brain. As of 1 March 2006, it has been obligatory for these warnings to cover 30 per cent of the front and 90 per cent of the back of the box. The graphics are meant to leave no doubt about what medical experts already know – that smoking kills. These new regulations are part of a series of recent changes that include the implementation of a nationwide policy of smoke-free pubs as well as other enclosed public spaces. Tobacco smoking is a serious public health problem. According to the Australian Institute of Health and Welfare, 17 per cent of Australians aged older than 14 years smoke daily. That’s about 3.4 million people. These people make up our beloved families, friends, neighbours and work colleagues. They commit themselves to a life plagued by lung and heart disease and potentially to cancer of the mouth, colon and every organ in between. Their passive smoke has also been implicated in reduced birth weights, lower respiratory illnesses and chronic respiratory symptoms in children. Globally, tobacco products are responsible for one in ten adult deaths each year (about five million people). But why do so many still insist on inhaling? Tobacco is profoundly addictive and the culprit is nicotine. Nicotine addiction is one of the most prevalent addictive behaviours worldwide. The physiological basis for nicotine addiction has been hotly debated for more than 40 years. A current theory proposes that nicotine has a dual response in the body. Initially, it stimulates the pleasure response from the brain but when taken over longer periods, it creates a relaxed state. Like a double-edged sword, nicotine withdrawal is a painful one, disproportionate to the pleasure often attributed to it. Withdrawal symptoms are time-limited and proportional to the depth of nicotine dependence. They include anxiety, irritability, difficulty concentrating, restlessness, tobacco craving (no huge surprise there), gastrointestinal problems, headaches and drowsiness. So having a drag makes you feel good and stops making you feel bad. Simple really — need I go on? Quitting is very difficult, there’s no doubt. The breadth of smoking cessation programs supports this. Behavioural interventions (physician advice, counselling and social supports), nicotine replacement (gum, patch, inhaler and nasal spray) and anti-depressants are the mainstay of most programs. Acupuncture, hypnosis, aversive therapies and exercise programs are touted as alternatives. Despite this, the long-term abstinence rates are somewhat pitiful – less than 25 per cent. It’s not hard to understand why. Aside from the physical pain of withdrawal, smoking is a powerful social tool. Asking someone for a light may start a conversation that finishes with a coffee date. The ‘smoko’ is a tradition of sorts, part of Australian culture. Picture a gathering of like-minded individuals, forced to engage in the activity against a backdrop of the biting-cold Melbourne wind, whilst smug ‘others’ sip lattes, shrouded in an angelic glow, warmed by the haze of their ducted heating system. Tobacco companies are required to adequately inform consumers about the risks, but have they? The right of accurate information is a fundamental consumer value. No smoker can be reasonably expected to fully appreciate all the risks associated with their ostracised behaviour. The tobacco industry claims that smokers are fully-informed about the risks, but this information appears superficial and without true understanding. As part of the new national changes, a general warning on the toxicity of cigarettes will replace details on nicotine, carbon monoxide and tar content, and packets will carry a phone number and web address for the national Quitline. These changes are vital in making a lasting impression on potential smokers. Do you think a 16-year-old girl who lights up in an attempt to impress school friends really understands the cigarette could lead to a nicotine addiction? Or do you think she realises this addiction could cause chronic airways disease, to such an extent that she needs to carry an oxygen tank with her at all times? Or that the airways disease could be so disabling, she may get short of puff trying to go to the toilet, thus forcing her to a life of incontinence pants and bed pans? Would she realise that it could cause her to have a stroke, thus rendering half of her body immobile? Despite all of these distractions, she still must attend her day centre three times a week for dialysis for her kidney failure, and chemotherapy for lung cancer. It doesn’t sound like the sort of life any 16-year-old would wish upon themselves. Is demonising smokers and smoking the answer? Amputated limbs, gangrenous toes, black teeth, holey and tarred lungs, young and old people on death’s door in hospital and milky porridge being milked from a ‘smoker’s aorta’ have become hallmarks of anti-smoking advertising in Australia. Legislation passed in NSW and Victoria seeks to ban all indoors smoking in pubs and clubs from 1 July 2007. Many venues are constructing smokers’ havens in the form of largely covered and walled courtyards and beer gardens, allegedly to cushion the blow of the new regulations. Smoking is currently restricted to a single room or less than 25 per cent of the total indoor area. Queensland and Tasmania have already banned indoor smoking, while South Australia and the ACT are set to follow suit. The anti-smoking lobby has painted an extremely unattractive portrait not just of smoking, but of smokers – the three-and-a-half million people, addicted to nicotine, who are also our friends and family. As a result of this, could it be that smoking has become as much a sinful pleasure as an act of rebellion, rather than of self harm? Shouldn’t we bring our smokers in from the cold? Could this acceptance help some to be anti-establishment in a less harmful way? Perhaps opening the door to these outcasts may help them on their road back to health. So now we know why people smoke and why it’s so difficult to quit, but how do we use this information to stop people killing themselves? We can inform people about all the risks, the implications smoking will have on their lives and finally help them find methods to quit that suit them. I have to admit something – I was one of them. Yes, me! I should have known better but, coffee in one hand, ciggie in the other – what a treat it was. But, I quit. Was it the warnings on cigarette packs? Fear of vascular disease? No, I just couldn’t breathe when I went for a run. So whether you have the smoking habit already, or are bothered by passive smoking, you should already be noticing some drastic changes around the country. Non-smokers will be happy about further smoke-free spaces, and smokers will be facing the graphic and in-your-face evidence that they should become like their non-smoking role-models. Surgeons from the Mayo Clinic (USA) claim they have developed a promising new process for mandible reconstruction following removal of oral cancer. The new method, which the investigators tested in rabbits, used distraction osteogenesis after tumor removal surgery to restore the missing portion of a patient’s jaw. With distraction osteogenesis, the surgeon made a cut at one of the remaining ends of the patient’s jawbone. As the break healed, the first phase of growth, soft tissue, appeared. The surgeon then stretched the pliable soft tissue under the tension of a device to fill in the gap in the patient’s jaw. Within 24 hours of completing the stretching process, physicians started administering radiation therapy to the mandible to decrease the likelihood of cancer recurrence. As the soft tissue healed, it hardened into bone. The investigators found that the radiation therapy, which they had suspected could interrupt the bone consolidation prior to the study, had no ill effects on the bone’s healing. Patients who might be candidates for the new reconstructive and treatment procedure have oral cancer involving part of the mandible. To completely remove the tumor surgically, surgeons have to remove part of the mandible. Without reconstructive surgery, patients would have difficulty eating and speaking, and would develop a significant facial deformity, says Eric Moore, M.D., Mayo Clinic ear, nose and throat surgeon and senior study investigator. Dr. Price says that it is also preferable to start the reconstruction when the tumor is removed, as demonstrated in this method, rather than wait until radiation therapy is completed, because immediate reconstruction minimises scar tissue and is better tolerated by the patient. The standard procedure for jaw reconstruction following removal of an oral cancer is transfer of bone from the patient’s fibula in the leg, along with surrounding muscle, skin and the supplying vessels. Although the aesthetic and functional result for the mandible can be good, this procedure has drawbacks. “If we could avoid the whole process of going to another part of the body in order to reconstruct a patient’s jaw, it would be best,” says Dr. Moore. Drs Price and Moore had been performing similar distraction osteogenesis in children born with small jawbones and wondered about the feasibility of using the procedure for adult oral cancer patients. They embarked on this research project to test it in animals and have tried this method on human oral cancer patients who were not appropriate candidates for the fibula transfer surgery. They have also utilized the method in patients who have benign tumors or who have suffered a trauma. The patients who have had distraction osteogenesis performed by Drs. Price and Moore compared the level of discomfort to having orthodontic braces. The devices used for the stretching procedure are submerged and not visible. The next step in this research, according to Dr. Price, is to study the distraction osteogenesis plus radiation therapy method in larger animals, comparing them to animals who are given distraction osteogenesis without radiation therapy. Details of the study were presented in June at the International Federation of Head and Neck Oncologic Societies meeting in Prague, Czech Republic. While it is established that nicotine by itself is not carcinogenic, researchers have now shown that nicotine promotes cell proliferation and the progression of tumors already initiated by tobacco carcinogens. In a study by Srikumar Chellappan and colleagues from the University of South Florida appearing online on July 20 in advance of print publication in the August issue of the Journal of Clinical Investigation, the authors show that the presence of receptors that bind nicotine, known as nicotinic acetylcholine receptors (nAChRs), on bronchial cells as well as lung cancer cells are key to nicotine-induced cell proliferation of lung cancer cells. nAChRs function mainly in the neuronal system, however recent studies have shown their expression and function in non-neuronal systems as well. In the current study, the authors show that stimulation of human non–small cell lung cancers (NSCLCs) as well as cells lining the air passages of the lung (known as bronchial cells) with a physiological concentration of nicotine leads to robust cell proliferation that is dependent on nAChRs. Furthermore, nicotine appears to activate the major components of the cell proliferation cycle in a manner very reminiscent of growth factors. Specifically, nicotine stimulation leads to the binding of Raf-1 to Rb, activation of cyclin-dependent kinases, phosphorylation of Rb, and recruitment of E2F1 to proliferative promoters. Previous studies had shown that interfering with the interaction of Rb and Raf-1 prevented cell growth and tumor growth. In the current study the same appears to be true for nicotine stimulation of cells. A role for the Rb–Raf-1 interaction in the genesis of lung cancer is further supported by the observation that there was more Raf-1 associated with Rb in 8 out of 10 tumor samples examined, compared to the adjacent normal tissues. These observations suggest a role for Rb–Raf-1 interaction in the genesis of lung cancer. These studies shed new light on the previously unknown mechanisms underlying nicotine-induced cell proliferation in lung cancer cells – namely that functional nAChRs on bronchial cells as well as lung carcinoma cells enable nicotine to promote the growth of established tumors. Joel B. Epstein, DMD, MSD et al. This research expands on our prior study, in which we assessed pain reduction after topical doxepin rinse in patients with oral mucositis resulting from cancer and cancer therapy. We continued to enroll patients with painful oral mucositis attributable solely to cancer therapy and performed further analysis on the duration of pain reduction. Fifty-one patients with oral mucositis were enrolled. Mucositis was scored and oral pain was assessed with a visual analog scale before doxepin oral rinse (5 mg/mL) and at regular intervals up to 4 h after rinsing. Of those who reported pain reduction, 95% did so within 15 min of rinsing with doxepin. In the total sample, the average patient reported a 70% maximum decrease in pain (P < 0.0001). Recurrence of pain was slow and at the conclusion of the study 19 patients (37%) still reported a reduction from baseline pain. With this censored data we used Cox-proportional hazards to determine what variables best explained longer duration of pain reduction. Our final model determined that more severe baseline pain, worse mucosal erythema score, or a larger relative maximum reduction in pain were all associated with a slower rate of pain recurrence after oral rinsing (all P < 0.01).